The Keepall 55 features a monogram canvas body, rolled leather handles, a detachable shoulder strap, and a top zip closure. It carries a B condition rating. 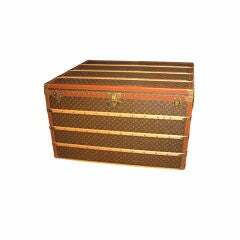 Dimensions: Length 31 cm Width 55 cm Depth 24 cm Drop 11 cm Inclusions: Padlock Louis Vuitton pieces do not come with an authenticity card—please refer to the production date code within the bag for its age and as an authenticity reference. Color: Brown x Dark Brown x Brown x Light Brown Material: Canvas x Monogram Canvas x Leather x Vachetta Leather Country of Origin: France Order Processing Time: Please allow 24-48 hours for your order to process, weekend orders will process on the next working business day. Delivery Time: Our items are located in warehouses across the globe, please allow approximately 5-8 days for delivery in US and 6-8 days in Europe. Item carries a smell and is slightly out of shape. Material is slightly worn and slightly discolored and slightly stained. Hardware is slightly rusty and missing. Exterior is slightly scratched.